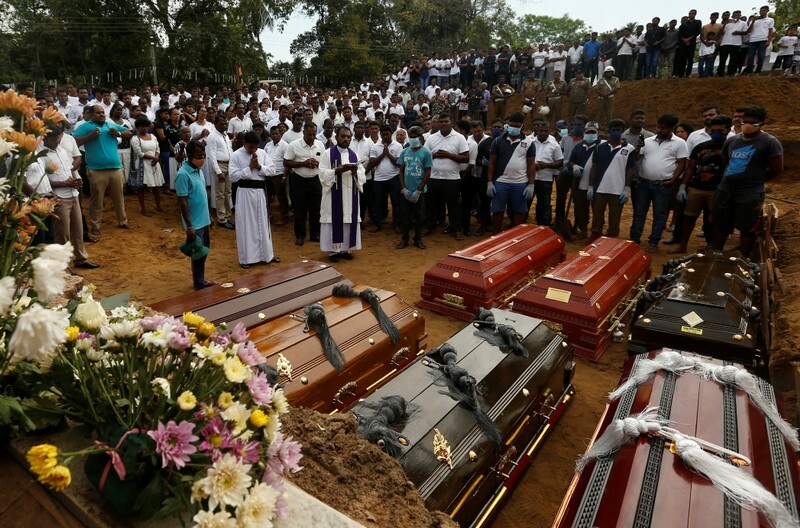 NEGOMBO, Sri Lanka (Reuters) – As mourners buried the remains of Christian worshippers killed by the Easter Sunday suicide bomb attacks in Sri Lanka, hundreds of Muslim refugees fled Negombo on the country’s west coast where communal tensions have flared in recent days. At least 359 people perished in the coordinated series of blasts targeting churches and hotels. Church leaders believe the final toll from the attack on St Sebastian’s Church in Negombo could be close to 200, almost certainly making Negombo the deadliest of the six near-simultaneous attacks. On Wednesday, hundreds of Pakistani Muslims fled the multi-ethnic port an hour north of the capital, Colombo. Crammed into buses organized by community leaders and police, they left fearing for their safety after threats of revenge from locals. Islamic State has claimed responsibility for the attacks, yet despite Islamic State being a Sunni jihadist group, many of the Muslims fleeing Negombo belong to the Ahmadi community, who had been hounded out of Pakistan years ago after their sect was declared non-Muslim. The fallout from Sunday’s attacks appears set to render them homeless once more. Farah Jameel, a Pakistani Ahmadi, said she had been thrown out of her house by her landlord. “She said ‘get out of here and go wherever you want to go, but don’t live here’,” she told Reuters, gathered with many others at the Ahmadiyya Mosque, waiting for buses to take them to a safe location. Sri Lanka’s government is in disarray over the failure to prevent the attacks, despite repeated warnings from intelligence sources. Police have detained an unspecified number of people were detained in western Sri Lanka, the scene of anti-Muslim riots in 2014, in the wake of the attacks, and raids were carried out in neighborhoods around St Sebastian’s Church. Police played down the threats to the refugees, but said they have been inundated with calls from locals casting suspicion on Pakistanis in Negombo. “We have to search houses if people suspect,” said Herath BSS Sisila Kumara, the officer in charge at Katara police station, where 35 of the Pakistanis that gathered at the mosque were taken into police custody for their own protection, before being sent to an undisclosed location. Two kilometers away, makeshift wooden crosses marked the new graves at the sandy cemetery of St Sebastian’s Church, as the latest funerals on Wednesday took the number buried there to 40. Channa Repunjaya, 49, was at home when he heard about the blast at St Sebastian’s. His wife, Chandralata Dassanaike and nine-year-old daughter Meeranhi both died. Meeranhi’s grandmother, with her head still bandaged after being wounded in the attack, was held by a relative as the first handfuls of earth were scattered upon her child-sized coffin. Most of Sri Lanka’s 22 million people are Buddhist, but the Indian Ocean island’s population includes Muslim, Hindu and Christian minorities. Until now, Christians had largely managed to avoid the worst of the island’s conflict and communal tensions. There were signs of some religious communities pulling together following Sunday’s outrage. Saffron- and scarlet-robed Buddhist monks from a nearby monastery handed out bottled water to mourners who gathered under a baking afternoon sun. But the town, which has a long history of sheltering refugees – including those made homeless by a devastating tsunami in 2004 – may struggle to recover from Sunday’s violence, said Father Jude Thomas, one of dozens of Catholic priests who attended Wednesday’s burials. COLOMBO (Reuters) – Sri Lankan police said on Wednesday they had detained 18 more people for questioning over the Easter Sunday attacks on churches and hotels, claimed by the Islamic State group, as the death toll climbed again to 359. The extremist Islamic State group made its claim after Sri Lankan officials said the suicide bombings in Sri Lanka were carried out in retaliation for attacks on two mosques in New Zealand that killed 50 people in March. Police spokesman Ruwan Gunasekera said the death toll had risen to 359 from 321 overnight, with about 500 people wounded, but did not give a breakdown of casualties from the three churches and four hotels hit by the bombers. Islamic State said through its AMAQ news agency the assaults in Sri Lanka were carried out by seven attackers but gave no evidence to support its claim of responsibility. If true, it would be one of the worst attacks carried out by the group outside Iraq and Syria. Junior minister for defense Ruwan Wijewardene told parliament on Tuesday two Sri Lankan Islamist groups – the National Thawheed Jama’ut and Jammiyathul Millathu Ibrahim – were responsible for the blasts, which went off during Easter services and as hotels served breakfast. Police continued searching homes across the Indian Ocean island nation overnight, leading to the detention of 18 more people. That brings the number of people taken in for questioning to close to 60, including one Syrian. The overnight raids included areas near the Gothic-style St Sebastian church in Negombo, north of the capital, where scores were killed on Sunday, a police spokesman said. An unspecified number of people were detained in western Sri Lanka, the scene of Muslim riots in 2014. “Search operations are going on everywhere, there is tight checking of Muslim areas,” a security source said. The Easter Sunday bombings shattered the relative calm that has existed in Buddhist-majority Sri Lanka since a civil war against mostly Hindu, ethnic Tamil separatists ended 10 years ago, and raised fears of a return to sectarian violence. Sri Lanka’s 22 million people include minority Christians, Muslims and Hindus. Until now, Christians had largely managed to avoid the worst of the island’s conflict and communal tensions. The attacks have already foreshadowed a shake-up of Sri Lankan security forces, with President Maithripala Sirisena saying on Tuesday night he planned to change some of his defense chiefs after criticism that intelligence warnings of an Easter attack were ignored. Three sources told Reuters that Sri Lankan intelligence officials had been warned by India hours before the blasts that attacks by Islamists were imminent. It was not clear what action, if any, was taken. Most of those killed and wounded were Sri Lankans, although government officials said 38 foreigners were also killed. That included British, U.S., Australian, Turkish, Indian, Chinese, Danish, Dutch and Portuguese nationals. The U.N. Children’s Fund said 45 children were among the dead. Junior defense minister Wijewardene said investigators believed revenge for the March 15 mosque attacks in the New Zealand city of Christchurch was the motive but did not elaborate. The attacks during Friday prayers in Christchurch were carried out by a lone gunman. The Sri Lankan government has imposed emergency law and an overnight curfew. It said it has also blocked online messaging services to stop the spread of inflammatory rumors that it feared could incite communal clashes. The U.S. Federal Bureau of Investigation is assisting with investigations. AHMEDABAD, India (Reuters) – On the night of February 28, 2002, two toddlers living in adjacent alleys were dragged out of a slum district in Ahmedabad in the western state of Gujarat that had been set ablaze by a mob in one of India’s worst ever Hindu-Muslim riots. The attack in the Naroda Patiya area of the state’s biggest city was among scores of clashes in which more than 800 Muslims and 255 Hindus were killed in the month-long violence in the home state of Narendra Modi. He had just become its chief minister and would rule there until becoming India’s prime minister in 2014. Rights groups say about 2,000 people were killed, mostly Muslims, and including scores of children. The toddlers who survived, a Muslim boy and a Hindu girl, were both one-year-olds at the time of the riots. Now, 17 years later, they are among an estimated 15 million first-time voters in a general election in which Modi and his Hindu nationalist Bharatiya Janata Party (BJP) are seeking a second term on a platform that, critics say, marginalises Muslims in favor of the nation’s majority Hindus. Mohammad Rafiq and Pooja Jadhav, now both 18, met for the first time during the Reuters interview. Jadhav hesitantly acknowledged Rafiq’s presence but said they were too shy to talk. “I have many Muslim female friends but I don’t talk to Muslim boys,” she said in the presence of her mother. But despite the silence between them, they have a lot in common. Both are largely uneducated and work 10 hour-days in menial jobs to support their families, who fled with them from one-room homes on that fateful day. Both want to secure permanent employment but do not have the educational qualifications, and say they want to vote for a party that will resolve this problem. They also want get married within their communities, move to better homes and forget the 2002 riots. But both grew up in a world of communal anger and are wary of people from the other religion. That is also reflected in their politics. “Even before I understood the word politics or elections, I was told that the BJP is an anti-Muslim political party,” said Rafiq who works at a factory printing election flags with symbols of the BJP and the main opposition party, Congress. 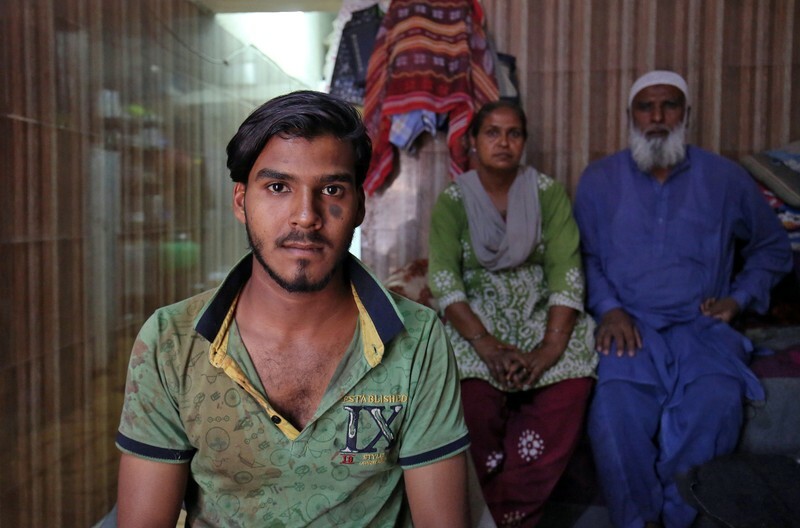 Rafiq’s family-run furniture shop and house were looted by Hindu men during the riots. His father was hit in the leg by a police bullet as he was fleeing the slum and his mother suffered head injuries when terrified people stampeded. The family lived in a relief camp and later moved into a house situated next to Ahmedabad’s biggest garbage collection site. “My rage towards the BJP is part of my life story. I can forgive but I cannot forget,” said Rafiq as he stood next to a huge black mound of garbage. “If Modi ever cared for Muslims he could come to see how we have learned to live with the stench from the landfill. His disrespect for Muslims defines my political choice,” said Rafiq, who said he will be voting for the Congress party at the polls in Gujarat on Tuesday. The votes from a 39-day staggered election will be counted on May 23. Back in 2002, at least 97 people, mostly Muslims, living in Naroda Patiya were killed and 950 houses and shops were set on fire in less than 10 hours. Modi, the state’s chief minister at the time, has faced allegations of allowing, or even encouraging, the Hindu attacks on Muslims, but he has vehemently denied the charges and a court-appointed investigation panel found no evidence to prosecute him. The attacks were in retaliation for the death of at least 59 Hindus after a train carriage carrying hundreds of pilgrims caught fire following a scuffle between Hindus and Muslims at a railway station in Gujarat. Demarcation along religious lines has become pronounced in Ahmedabad since the riots. Hindus refused to sell houses to Muslims, forcing them to set up ghettos on the edges of the prosperous city. Rafiq’s father sold the house in Naroda Patiya and used the money to start a metal trade business, and buy clothes and items for their new home, which was given to them by a Muslim charity organization. “We had a choice to go back and live in the house where my neighbors were killed or live near this garbage site. My father chose the garbage site,” said Rafiq. Rafiq traveled with Reuters to his old home in Naroda Patiya for the first time in two years. He met his relatives and stood near the house now owned by Muslims not known to him. “The air is better here. There is no stench. I would have been happier if we lived here,” said Rafiq. By contrast, Jadhav’s family returned to their partially damaged house in Naroda Patiya after the riots to live among Muslim neighbors. “We had no choice. Muslim victims left this area and new Muslims came to live here. We are stuck,” she said. Over a dozen members of 37 Hindu families in Naroda Patiya interviewed by Reuters said they want to live in a Hindu neighborhood but they lack the financial resources to move. When Modi became prime minister in 2014, Jadhav said her mother, a widow, celebrated his victory. “Seeing her happy made me happy too. I have nothing against Muslims, but I like Modi,” said Jadhav, who works as a domestic helper. Jadhav says she is comforted by BJP rule, especially living among Muslims. But she declined to say who she will vote for. “We live in a country ruled by the BJP and Muslims know that they cannot behave badly with us. No one wants riots again,” said Jadhav. She says she enjoys listening to Modi’s speeches emphasizing his pro-Hindu brand of nationalism. “I have heard about the riots and since then I know Muslims and Hindus should not engage after a point. There has to be a boundary forever,” she said. The teenagers are both products of angry times. “Children read comic books, fairy tales but we have grown up listening about Hindu, Muslim riots. My vote will be my reaction to our painful past,” said Rafiq as he scanned his mobile phone to play and sing the latest Bollywood hip hop song. “Our time will also come,” he sang in the Hindi language and smiled at Jadhav. She hesitantly smiled back as she stood at door of her home. COLOMBO (Reuters) – Sri Lankans woke to emergency law on Tuesday as authorities searched for those behind suicide bomb attacks on churches and luxury hotels that killed 290 people at the weekend, with the focus turning to militants with links to foreign groups. No group has yet to claim responsibility for Easter Sunday’s attacks on three churches and four luxury hotels that also wounded about 500 people. Police spokesman Ruwan Gunasekera said the number of people arrested since Sunday had risen from 24 to 40. They are mainly Sri Lankans, although Gunasekera said police were investigating whether foreigners were involved in the attacks carried out by seven suicide bombers. The president’s office declared that emergency law would come into effect from midnight, giving police extensive powers to detain and interrogate suspects without court orders. An overnight curfew was also put into effect. 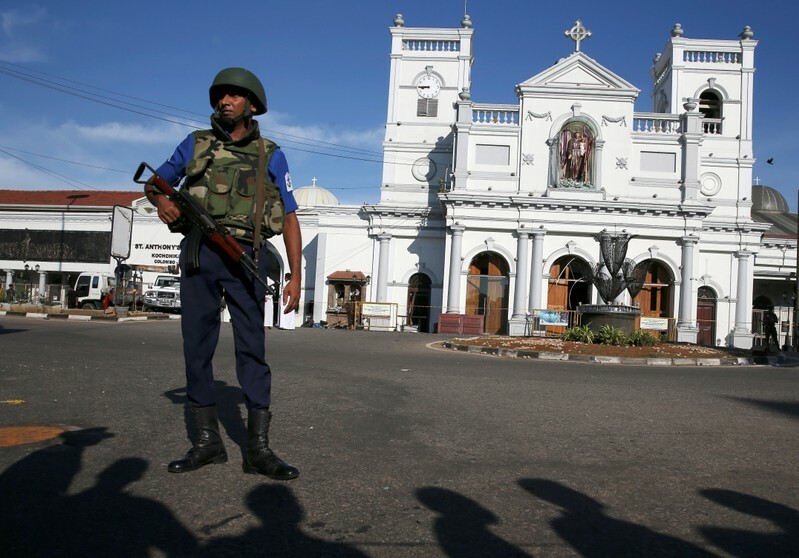 The declaration came after nerves were frayed even further in the seaside capital Colombo when explosives went off on Monday near one of the churches hit in Sunday’s attacks while bomb squad officers were working to defuse a device. CNN reported the blast was a controlled detonation. Tuesday was also declared a national day of mourning. The attacks brought a shattering end to a relative calm that had existed in the Indian Ocean island since a bitter civil war fought by Tamil separatists ended 10 years ago and raised fears of a return to sectarian violence. It also underlined concerns over fractures in the Sri Lankan government, with questions raised over whether an intelligence tip-off was shared at the appropriate levels. A government spokesman has said an international network was involved in the bombings but suspicion has focused on Islamist militants in the Buddhist-majority South Asian country. The nation of about 22 million people also has significant numbers of Hindus, Muslims and Christians. The Washington Post quoted an unidentified law enforcement official as saying Federal Bureau of Investigation (FBI) agents were being sent to Sri Lanka to assist in the investigation. The FBI has also offered laboratory expertise to test evidence and analysts were scouring databases for information that might shed light on tea attacks, the Post said. U.S. intelligence sources said the attacks carried some of the hallmarks of the Islamic State extremist group, although they were cautious because the group had not claimed responsibility. Islamic State is usually quick to claim responsibility for, or links to, attacks against foreign targets or religious groups whether they were involved or not. A document seen by Reuters showed that police had received a tip-off of a possible attack on churches by a little-known domestic Islamist group this month. The intelligence report, dated April 11, said a foreign intelligence agency had warned authorities of possible attacks on churches by the National Thawheed Jama’ut group. It was not immediately clear what action, if any, was taken in response. Questions over why the intelligence warning was not acted upon could feed into a feud between Prime Minister Ranil Wickremesinghe and President Maithripala Sirisena. Sirisena fired Wickremesinghe last year only to be forced to reinstate him under pressure from the Supreme Court and their relationship is reported to be fraught. International experts said, even if a Sri Lankan group had carried out the attacks, it was likely that al Qaeda or Islamic State were involved given the level of sophistication of the apparently coordinated bombings. Footage on CNN showed what it said was one of the bombers wearing a heavy backpack. The man patted a young child on the head before entering the Gothic-style St. Sebastian church in Katuwapitiya, north of Colombo. Dozens were killed there. Most of the dead and wounded were Sri Lankans, although government officials said 32 foreigners were killed. That included British, U.S., Australian, Turkish, Indian, Chinese, Danish, Dutch and Portuguese nationals. China’s embassy in Sri Lanka warned Chinese nationals on Tuesday against traveling to Sri Lanka in the near term because of “huge security risks”. China is a major investor in Sri Lanka. The embassy said one Chinese national was killed, five were wounded and another five were missing. Among the victims were three of the four children of Anders Holch Povlsen, Denmark’s richest man. Eight Britons were also killed, including Anita Nicholson, her 14-year-old son and her 11-year-old daughter. Nicholson’s husband survived the attack on the Shangri-La Hotel in Colombo. 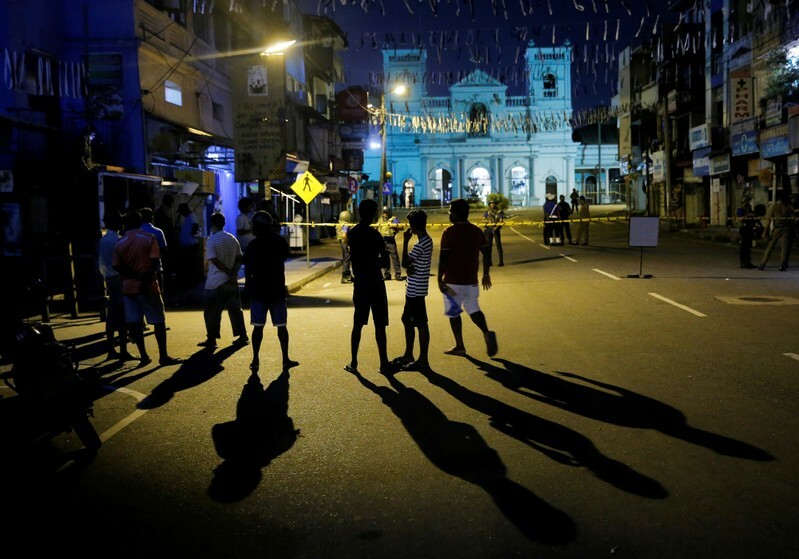 COLOMBO (Reuters) – Authorities lifted a curfew in the Sri Lanka on Monday, a day after 290 people were killed and about 500 wounded by a string of bombings that tore through churches and luxury hotels on Easter Sunday. capital of predominantly Buddhist Sri Lanka, and a third church on the country’s northeast coast. 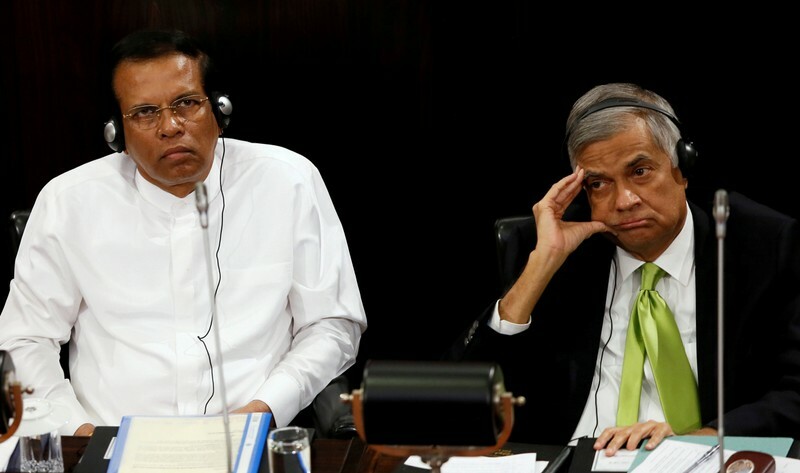 A government source said President Maithripala Sirisena, who was abroad when the attacks happened, had called a meeting of the National Security Council early on Monday. Prime Minister Ranil Wickremesinghe would attend the meeting, the source said. had been a petrol bomb attack on a mosque in the northwest and arson attacks on two shops owned by Muslims in the west. Sri Lanka had been at war for decades with Tamil separatists but extremist violence had been on the wane since the civil war ended 10 years ago. The island-wide curfew imposed by the government was lifted early on Monday, although there was uncharacteristically thin traffic in the normally bustling capital. district, where the four hotels were targeted on Easter Sunday, according to a Reuters witness. Scores of people who were stranded overnight at the main airport began making their way home as restrictions were lifted. The government also blocked access to social media and messaging sites, including Facebook and WhatsApp, making information hard to come by. Wickremsinghe acknowledged on Sunday that the government had some prior information about possible attacks on churches involving a little-known Islamist group, but said ministers had not been told. foreigners were also killed. These included British, U.S., Turkish, Indian, Chinese, Danish, Dutch and Portuguese nations. One Australian survivor, identified only as Sam, told Australia’s 3AW radio the hotel was a scene of “absolute carnage”. He said he and a travel partner were also having breakfast at the Shangri-La when two blasts went off. He said he had seen two men wearing backpacks seconds before the blasts. There were similar scenes of carnage at two churches in or near Colombo, and a third church in the northeast town of Batticaloa, where worshippers had gathered for Easter Sunday services. Pictures from the scene showed bodies on the ground and blood-spattered pews and statues. Dozens were killed in one of the blasts at the Gothic-style St. Sebastian church in Katuwapitiya, north of Colombo. Police said they suspected that blast was a suicide attack. Three police officers were also killed when security forces raided a house in Colombo several hours after the attacks. Police reported an explosion at the house. KOBANI, Syria (Reuters) – A community of Syrians who converted to Christianity from Islam is growing in Kobani, a town besieged by Islamic State for months, and where the tide turned against the militants four years ago. The converts say the experience of war and the onslaught of a group claiming to fight for Islam pushed them towards their new faith. After a number of families converted, the Syrian-Turkish border town’s first evangelical church opened last year. Islamic State militants were beaten back by U.S. air strikes and Kurdish fighters at Kobani in early 2015, in a reversal of fortune after taking over swaths of Iraq and Syria. After years of fighting, U.S.-backed forces fully ended the group’s control over populated territory last month. Though Islamic State’s ultra radical interpretation of Sunni Islam has been repudiated by the Islamic mainstream, the legacy of its violence has affected perceptions of faith. Many in the mostly Kurdish areas of northern Syria, whose urban centers are often secular, say agnosticism has strengthened and in the case of Kobani, Christianity. Christianity is one of the region’s minority faiths that was persecuted by Islamic State. Critics view the new converts with suspicion, accusing them of seeking personal gain such as financial help from Christian organizations working in the region, jobs and enhanced prospects of emigration to European countries. The newly-converted Christians of Kobani deny those accusations. They say their conversion was a matter of faith. Firas works for a Christian aid group at a nearby camp for displaced people that helped set up the church. He said around 20 families, or around 80 to 100 people, in Kobani now worship there. They have not changed their names. “We meet on Tuesdays and hold a service on Fridays. It is open to anyone who wants to join,” he said. The church’s current pastor, Zani Bakr, 34, arrived last year from Afrin, a town in northern Syria. He converted in 2007. “This was painted by IS as a religious conflict, using religious slogans. Because of this a lot of Kurds lost trust in religion generally, not just Islam,” he said. One man, who lost an arm in an explosion in Kobani and fled to Turkey for medical treatment, said he met Kurdish and Turkish converts there and eventually decided to join them. “They seemed happy and all talked about love. That’s when I decided to follow Jesus’s teachings,” Maxim Ahmed, 22, said, adding that several friends and family were now interested in coming to the new church. 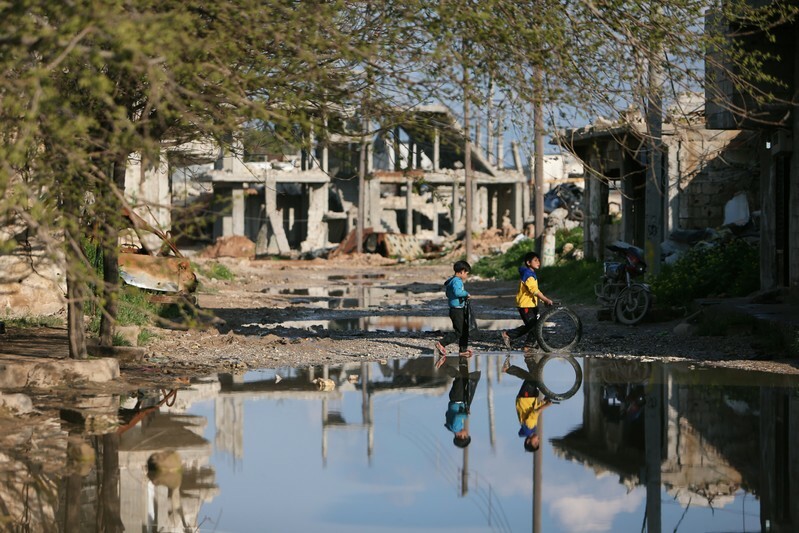 Some in Kobani reject the growing Christian presence. They say Western Christian aid groups and missionaries have exploited the chaos and trauma of war to convert people and that local newcomers to the religion see an opportunity for personal gain. “Many people think that they are somehow benefitting from this, maybe for material gain or because of the perception that Christians who seek asylum abroad get preferential treatment,” said Salih Naasan, a real estate worker and former Arabic teacher. Thousands of Christians have fled the region over decades of sectarian strife. From Syria they have often headed for Lebanon and European countries. U.S. President Donald Trump pledged to help minorities fleeing the region when he imposed a travel ban on Muslims in 2016, but many Christians were denied asylum. “It might be a reaction to Daesh (Islamic State) but I don’t see the positives. It just adds another religious and sectarian dimension which in a community like this will lead to tension,” said Naasan, a practicing Muslim. Naasan like the vast majority of Muslims rejects Islamic State’s narrow and brutal interpretation of Islam. The group enslaved and killed thousands of people from all faiths, reserving particular brutality for minorities such as the Yazidis of northern Iraq. Most Christians preferred not to give their names or be interviewed, saying they fear reaction from conservative sectors of society. The population of Kobani and its surroundings has neared its original 200,000 after people returned, although only 40,000 live in the town itself, much of which lies in ruins. 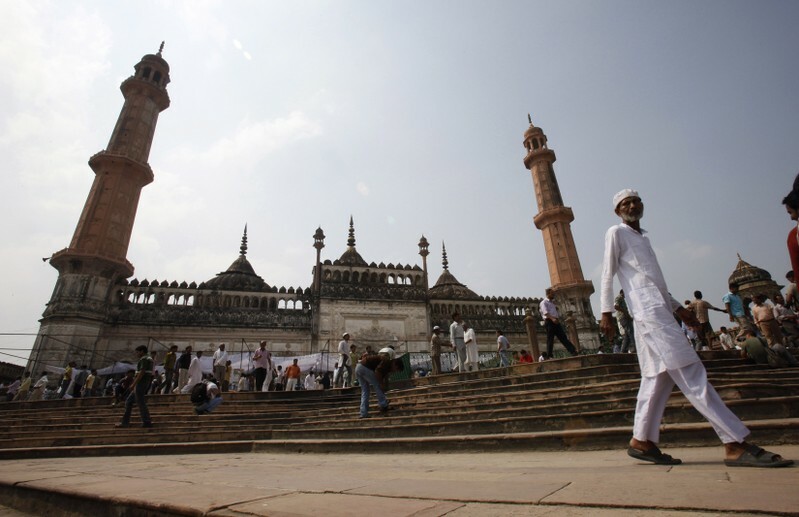 NEW DELHI (Reuters) – India’s Supreme Court agreed on Tuesday to consider a petition from a Muslim couple to allow women into mosques, seeking to overturn a centuries-old practice that largely bars women from the places of worship. Women are not allowed inside most mosques in India although a few have separate entrances for women to go into segregated areas. The petitioners, Yasmeen Peerzade and her husband Zuber Peerzade, said that women were allowed to enter mosques during the time of the Prophet Mohammad. “Like men, women also have the constitutional rights to offer worship according to their belief,” they said in their petition. “There should not be any gender discrimination and allow Muslim women to pray in all mosques,” they said. The court last year lifted a ban on the entry of women of menstrual age at a Hindu temple in southern India saying it was a violation of their right to worship. The Muslim couple referred to the temple ruling, which angered conservative Hindus, as a precedent to support their call for women to be allowed to pray at mosques. A representative of a prominent organization of Islamic scholars, the Jamiat Ulema-e-Hind, was not immediately available for comment. The petition comes at a sensitive time for relations been minority Muslims and the majority Hindu community. Some members of Prime Minister Narendra Modi’s Hindu nationalist ruling party have been accused of stirring communal animosity as the party seeks a second term in a staggered general election now underway. Supreme Court judge S.A. Bobde said the court will examine the couple’s request at length. The court in 2017 ruled as unconstitutional a law which allows Muslim men to divorce their wives simply by uttering the word “talaq”, which means divorce in Arabic, three times. This year, the government issued an executive order making instant divorce an offence punishable with up to three years in jail. 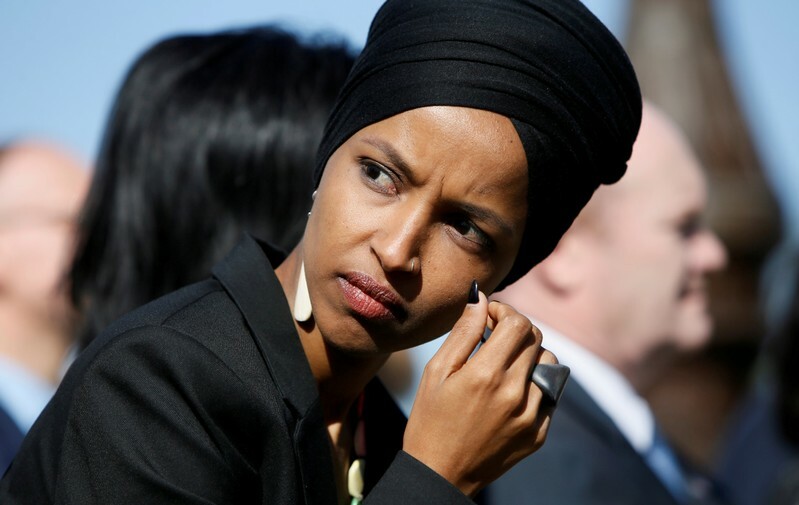 WASHINGTON (Reuters) – U.S. President Donald Trump attacked Democratic U.S. Representative Ilhan Omar as an “out of control” purveyor of “hate” speech on Monday before leaving for a visit to the state the Muslim-American represents in Congress. Writing on Twitter, Trump blasted both Omar and House Speaker Nancy Pelosi for defending Omar after he tweeted a video on Friday suggesting Omar had been dismissive of the Sept. 11, 2001, attacks. Omar’s and Pelosi’s offices had no comment on Monday. “Violent rhetoric and all forms of hate speech have no place in our society, much less from our country’s Commander in Chief. We are all Americans. This is endangering lives. It has to stop,” Omar wrote in a tweeted statement. Marc Lotter, an adviser to Trump’s 2020 re-election campaign, denied Trump was inciting violence. “I don’t think it is the president who’s putting her in danger. I think it’s her ill-thought-out words that she used to describe the greatest terror attack on the history of United States soil,” Lotter told CNN on Monday. The video tweeted by Trump spliced news footage of 9/11 with a clip from a speech Omar gave last month in which she said “some people did something” in reference to the attacks. Later on Monday, Trump plans to visit a trucking company in Burnsville, Minnesota, about 15 miles (24 km) outside Minneapolis. The venue is in the state’s second congressional district, which is south of and partially adjacent to the fifth congressional district represented by Omar. The Minnesota branch of the Council on American-Islamic Relations (CAIR), a Muslim civil rights and advocacy group, will hold a rally in support of Omar outside the company. The White House said Sunday that Trump did not wish any harm in his Twitter post about Omar. 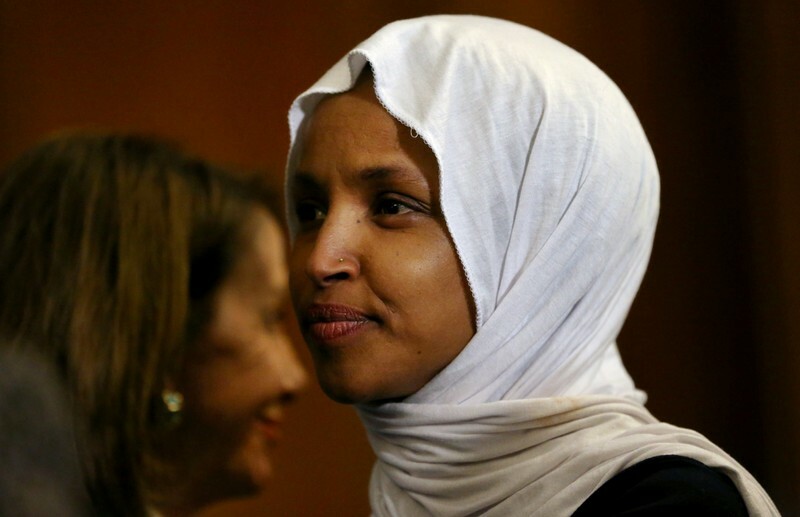 House Speaker Nancy Pelosi announced Sunday that she has taken steps to ensure the safety of Rep. Ilhan Omar following President Donald Trump’s retweet of a video that purports to show the Minnesota Democrat being dismissive of the Sept. 11 terrorist attacks. The California Democrat also called on Trump to take down the video. Soon after her public request, the video was no longer pinned to the top of Trump’s twitter feed. Pelosi was among Democrats who had criticized Trump over the tweet, with some accusing him of trying to incite violence against the Muslim lawmaker who has already seen one upstate New York man face criminal charges for making death threats against her. The White House defended Trump earlier Sunday, saying the president has a duty to highlight Omar’s history of making comments that others find offensive and that he wished no “ill will” upon the first-term lawmaker. “They will continue to monitor and address the threats she faces,” the speaker said. She called on Trump to discourage such behavior. Neither Trump’s tweet nor the video included Omar’s full quote or the context of her comments, which were about Muslims feeling that their civil liberties had eroded after the attacks. The tweet was posted atop Trump’s Twitter feed for much of Sunday, with more than 9 million views. It remained lower in the feed after Pelosi made her request for the video to be pulled. Sanders questioned why Democrats weren’t following Trump’s example and calling out Omar, too. Democrats who criticized the president over the tweet defended Omar. Some also noted their past disagreements with her. Rep. Jerry Nadler, a New York Democrat whose constituents include Manhattan’s financial district, which was targeted on Sept. 11, 2001, said he had no issues with Omar’s characterization of the attack. WASHINGTON (Reuters) – President Donald Trump did not wish any harm in his Twitter post criticizing Democratic Congresswoman Ilhan Omar’s comments on the 9/11 attacks, White House spokeswoman Sarah Sanders said on Sunday. “Certainly President is wishing no ill will, certainly not violence towards anyone,” Sanders told broadcaster ABC News’ “This Week” show. “But the President is absolutely and should be calling out the congresswoman for her, not only one-time, but history of antisemitic comments,” she said. Lawmakers from Trump’s Republican party have accused Omar of minimizing the 9/11 attacks, while critics of the president say he took Omar’s words out of context in order to stoke anti-Muslim sentiment. Several prominent Democrats, including presidential hopeful Senators Bernie Sanders and Elizabeth Warren, condemned Trump’s tweet, saying he was inciting racism and violence towards Omar with the video. House Speaker Nancy Pelosi on Saturday criticized the president for using the “sacred” memory of 9/11 for a political attack. Sarah Sanders called Omar’s comments “disgraceful and unbefitting,” and questioned what she sees as lack of action from Democrats on the issue. “I think it’s a good thing that the president is calling her out for those comments and the big question is why aren’t the Democrats doing it,” she said.